Tiger Woods had five different drugs in his system when he was arrested on suspicion of driving under the influence (DUI) in May, according to a toxicology report. A urine test revealed a mixture of strong painkillers, sleep and anxiety drugs and THC, which is a chemical component of marijuana. The former world number one, 41, sought "professional help" after his arrest. 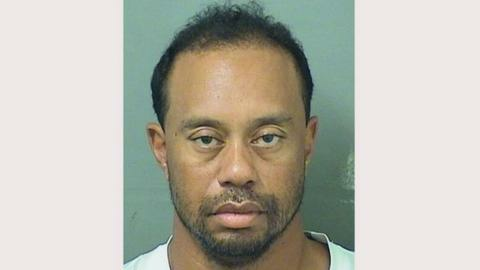 The 14-time major winner pleaded not guilty to the DUI charge last week. Woods, who is recovering from a fourth back operation, is now expected to admit a lesser charge of reckless driving and enter a 12-month probation programme. "As I previously said, I received professional help to manage my medications," said Woods on Monday. "Recently, I had been trying on my own to treat my back pain and a sleep disorder, including insomnia, but I realise now it was a mistake to do this without medical assistance." American Woods was arrested near his Florida home on 29 May, after police found him asleep in his car on the side of the road. He denied alcohol was involved and said it was down to "an unexpected reaction to prescribed medication". Woods has not won a tournament since 2013, while his title drought in major championships dates back to 2008. Last December, he returned to action after 15 months out injured but has not played since his back problems recurred in February. What have we learned from 2017's majors?